John Miller graduated from Moundsville High School, received a BS in biology and mathematics from West Liberty, and an MA from West Virginia University in Mathematics education. 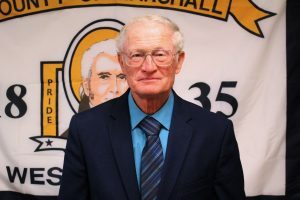 John has been married to Mary Alice Wright Miller for over 37 years, and their three children, Mary Ann, Philip and Scott received their public education in the Marshall County School system. John currently serves on the board of directors of the Marshall County Farm Bureau. He is past president of the board of directors of the Marshall County Co Op and is a deacon and class teacher at the Cedar Avenue Church of Christ. John taught mathematics at Moundsville Jr. High for two years, Vandevender Junior High, Parkersburg, for 1 year and at John Marshall High School for 38 years, including 16 years of summer school. John and Mary Alice both retired from teaching at John Marshall in June of 2010.